Most tiles retain residue from the manufacturing process. 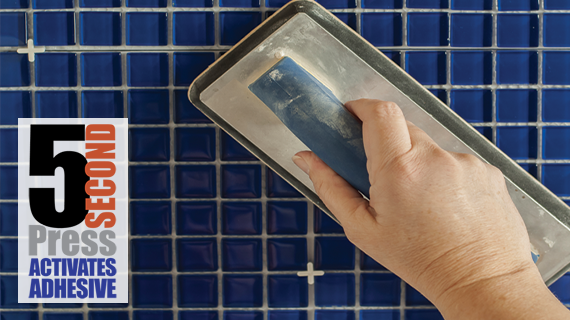 Clean the back of each tile with a damp sponge and dry thoroughly. Also, clean and dry each tile following the use of a tile wet saw. 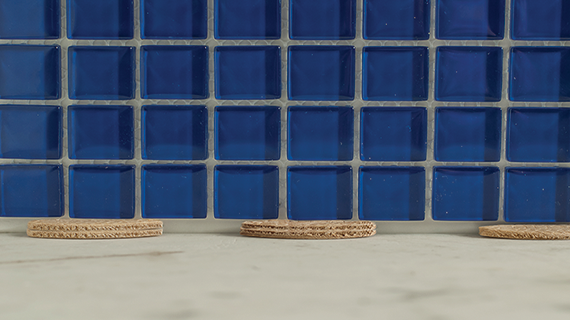 Support the bottom row of tile with molding, tub edge, countertop, metal strip, tile spacer or similar edge. When placing tile around an outlet, be sure the outlet cover hides the tile edges. 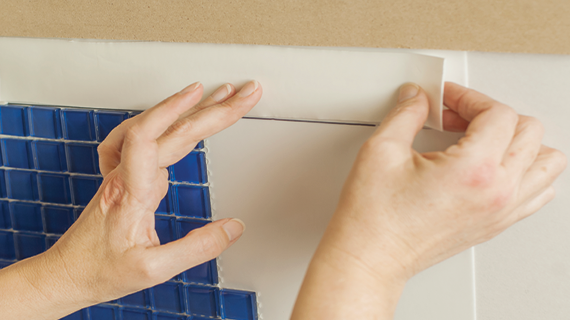 If not using self-spacing tiles, place minimum 1/8” (3.175mm) tile spacers at top corners of tiles to ensure the following row of tiles is square and evenly spaced. 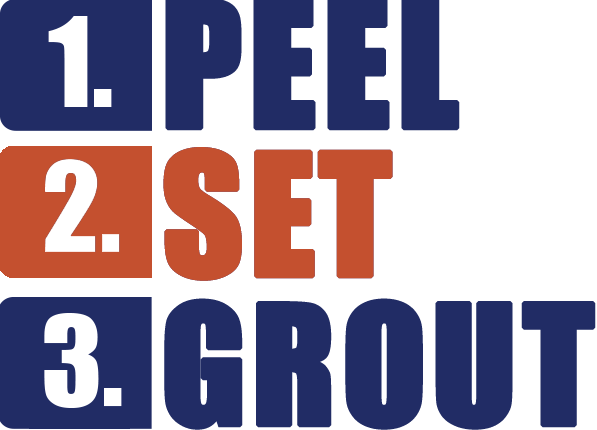 Set tiles into desired layout by GENTLY pressing tiles onto MusselBound to ensure repositioning is possible if needed. 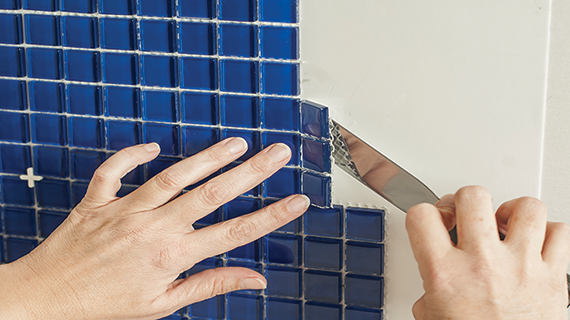 If needed, remove tile with your fingertips or, if necessary, carefully pry up tile with a flat-tipped screwdriver or putty knife. Protect adjacent tile with a flat, sturdy object if required. MusselBound is still active and will re-bond to the tile. When completely satisfied with tile layout, firm pressure will secure tiles into place. 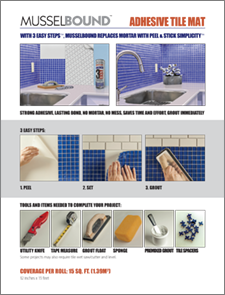 Follow immediately with 5-second press with grout float to activate lasting adhesive bond. 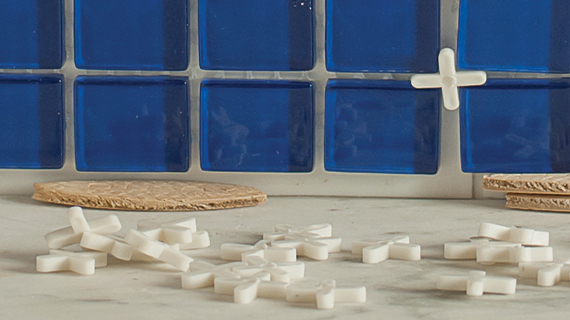 Leave spacers in place until ready to grout. If tiles are not of similar thickness and you wish to make the finished surface even, MusselBound may be layered to bring the thinner tiles level with the thicker tiles.